Click for the full slideshow. Anchorage Representative Harriet Drummond loves the “big kangaroo pocket” of her borrowed kuspuk. Photo by Lisa Phu. 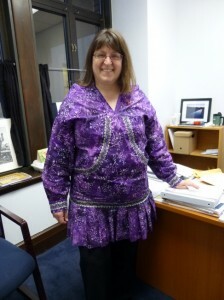 Instead of the usual businesswear worn in the Alaska State Capitol, many female legislators are wearing kuspuks, the traditional and comfortable Inupiat-Yupik garment not often seen in boardrooms. It’s also being adopted by some men in the capitol. On this particular Friday, Senate Secretary Liz Clark’s kuspuk is getting a lot of attention. Clark owns five kuspuks. She and other legislative staff easily joined what’s become a tradition among legislators, who started wearing kuspuks to work on Friday about a decade ago. Anchorage Senator Lesil McGuire credits the idea to former representative Mary Kapsner, an Alaska Native from Bethel. When Real passed away from an illness, Kapsnor and other women in the House of Representatives continued wearing kuspuks to honor her legacy. Kuspuk Friday soon spread to the Senate where now it’s part of the Friday uniform for the pages. The Senate Secretaries, the Sergeant-At-Arms, and her assistant also take part in the tradition. Three of these kuspuk-clad individuals on the Senate floor are men. Senate McGuire would like to see every more males embrace kuspuk Friday. Eagle River Senator Anna Fairclough served with Mary Kapsner. Most Fridays, Fairclough can be seen wearing a kuspuk. While she enjoys the functional purposes of the garment, like the big pockets, Fairclough says Kuspuk Friday means something more. While a kuspuk is a traditional Alaska Native garment, Senator McGuire notes most of those wearing kuspuks on Friday in the Capitol Building are not Native. Wrangell Representative Peggy Wilson owns four kuspuks. Freshman Representative Harriot Drummond of Anchorage borrowed a kuspuk from a friend for Kuspuk Fridays. She says it fits her normal, outside-the-capitol style. In the usual sea of dark suits and stiff collars in a state capitol, Kuspuk Friday adds a touch of fun, color, and comfort to the work week. It’s also a symbol of Alaska’s diversity of cultures and people. Previous articleCohousing: What Exactly IS It?